At the Citizenship Ceremony in HoveTown Hall today, there was a special presentation made to Leonardo Mayo Andres, Jr., a 35 year old Phillippino national. Leo, who came to the UK seven years ago, and now works as a nurse in the Royal Sussex County Hospital, was the 3,000th individual to gain his citizenship certificate in Brighton and Hove. 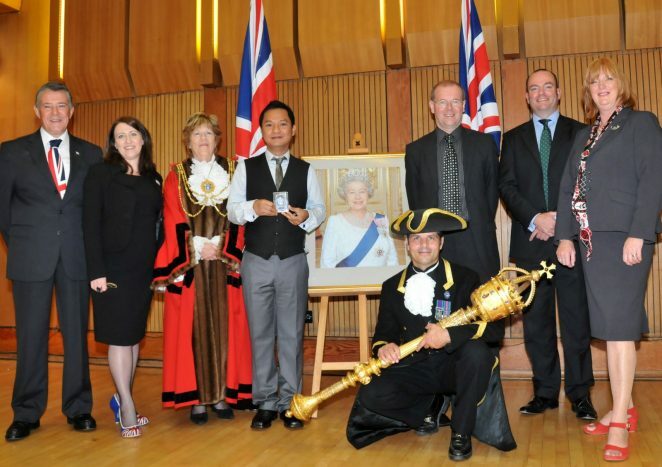 Leo was one of forty four individuals from more than twenty one different countries who, having successfully passed their citizenship tests, attended the ceremony, along with family and friends, to receive their certificates from the Mayor of Brighton and Hove, Councillor Ann Norman. The Deputy Lord Lieutenant of the County of East Sussex, Roger French, and the Acting Chief Executive of Brighton and Hove City Council, Alex Bailey also attended. From left to right: Andrew Woolmer, Registrar, Citizenship Team: Dendi Wolfsky-Batson, Registrar, Citizenship Team: The Mayor of Brighton and Hove, Councillor Ann Norman, Leonardo Andres, Robert Robertson, Mace Bearer: Roger French, Deputy Lieutenant of the County of East Sussex: Alex Bailey, Acting Chief Executive of Brighton and Hove Council, and Linda Holm, Superintendant Registrar.